17 May Constitution Day in Norway always falls on May 17th each year commemorating the signing of the Constitution on May 17, 1814 in Eidsvoll. 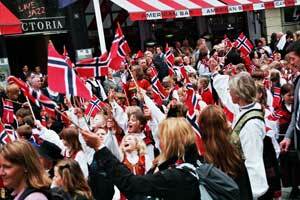 The main event for this day are the children's parades that are held in many cities around Norway. Some cities will also have a peoples parade in the afternoons. People who attend the parades show patriotism by waving the Norwegian flags in celebration of their countries founding constitution. Norway had its constitution signed on May 17, 1814 ending a 100 year partnership with Sweden. Prior to the 100 year partnership with Sweden the Danish had controlled Norway.